UAE National Day means much more to me than just a public holiday. December 2 is special. It focuses my mind on our nation’s successes like no other. It reminds me that with unity of thought and effort nothing is impossible. The decision of our rulers to unfurl the UAE flag for the first time on December 2, 1971, was a sign of strength and determination. Old hurts were forgiven, old feuds buried. Agreed borders — a federal government permitting each emirate to have autonomy and a written constitution — brought peace and economic advancement. With unity came strength. It won’t last, said the naysayers, tribal divisions will prevail. But not only has it sustained, it has grown from strength to strength. We no longer think of ourselves as nationals of Abu Dhabi, Dubai, Sharjah, Ajman, Fujairah, Umm Al Quwain or Ras Al Khaimah. We are all Emiratis. 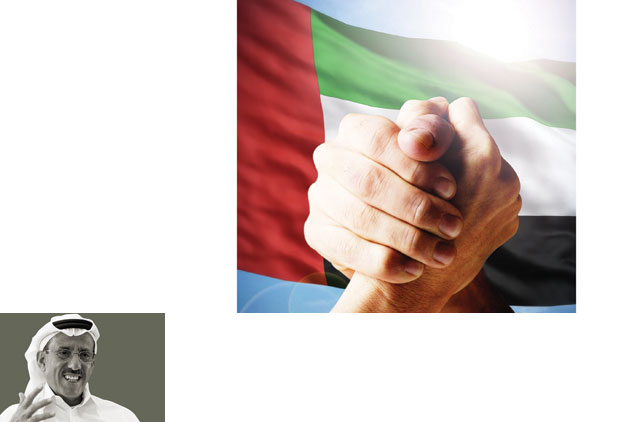 For that our gratitude must go to the respective rulers of Abu Dhabi and Dubai — Shaikh Zayed Bin Sultan Al Nahyan and Shaikh Rashid Bin Saeed Al Maktoum — the driving forces behind the Union. I feel lucky to have known them; they changed my life in different ways, detailed in my recently published ‘tell all’ memoir titled Khalaf Al Habtoor, the autobiography. They ruled by example and for us, they were more like gentle fathers than rulers, devoting every waking minute to their people’s well-being. Cognisant that oil is a dwindling resource, their mission was to encourage and support the growth of the country’s infrastructure, trade and commerce. They finely balanced their inherent conservatism with breathtaking vision. We mourned their passing as though they were members of our own families. They left behind solid foundations of prosperity; they put the UAE firmly on the map. More than that, they assured political continuity by bequeathing their sons — President His Highness Shaikh Khalifa Bin Zayed Al Nahyan and His Highness Shaikh Mohammad Bin Rashid Al Maktoum, Vice-President and Prime Minister of the UAE and Ruler of Dubai — to bring their dreams to fruition, in partnership with the rulers of the five other emirates. Kudos to Shaikh Khalifa and Shaikh Mohammad for pulling the UAE through the 2008-09 global economic crisis that hit our nation eliciting doom-laden predictions in western newspapers. Dubai bore the brunt of attacks. Pundits ‘saw’ Dubai disappearing below the sands of our ambition. They’ve since been made to eat their words. The UAE has been back for some time … and how! Sad to say, this hasn’t prevented the snipes of foreign columnists like Simeon Kerr writing in the Financial Times under the headline ‘Dubai, a spot of the old hubris’. Our success still rankles. In 2009, Kerr was penning articles titled ‘A world beater carried away by its success’ and ‘Good times end in Dubai’. Sorry, we couldn’t oblige you, Mr Kerr! My belief in Dubai never faltered even when static cranes dominated the skyline. I told everyone that the downturn was a blip in our path. Like others whose confidence could not be shaken, I’m investing in Dubai with three luxurious new hotels (St Regis, W Hotel and Westin) on Shaikh Zayed Road where the Dubai Metropolitan used to be and the construction of the Waldorf Astoria on the Palm Jumeirah is poised to welcome its first guests next year. Many will enjoy this special day enjoying quality family time or relaxing with friends. But let’s also use it to count our blessings and celebrate our country’s multicultural environment that makes it a unique international hub for multi-talents, while nurturing Arab talent, previously lost to the West. Let’s appreciate our modern cities, built with infra and super structures that are acknowledged as second to none. And let’s remind ourselves that in just over four decades, the UAE has phenomenally emerged as a major international tourist destination propelled by world-beating airports and airlines. Our governments have achieved wonders for their people but they have not forgotten the needy within our region and other areas of the world; their compassion extends to all irrespective of nationality, religion, race or colour. Such humanitarian values have contributed to the respect Emiratis enjoy wherever they travel. It is my hope that the GCC will evolve into a strong political, economic and military federation, that our rulers and citizens become even closer and our culture and traditions remain the basis on which we lead our lives. Although we may have deviated from them a little, today, we must all remind our children and grandchildren that they are the invisible threads that bind us. On this momentous occasion, I would like to congratulate Shaikh Khalifa, Shaikh Mohammad, the other rulers and proud citizens on the 41st UAE National Day. May God bestow on us His grace, and may we always be blessed with safety and security. Khalaf Ahmad Al Habtoor is a businessman and chairman of Al Habtoor Group.